“Operator Ugly” is a Fitness test designed for Military Operators. There are seven parts plus a warm up. The test is designed to be completed in 90-105 minutes. An issue I struggled with in designing this test was how to test strength. The obvious way was to do a 1 rep max strength test. Issues arise with this – safety for one. Also, standardizing how to score the result is difficult. I’ve been intrigued by the 225# for reps bench press test the NFL uses at its combine for the draft, but knew that 225# for reps was too heavy for military athletes. Thus – I chose 185# for loading. A military athlete should be able to bench press 185# for reps.
Why bench press and front squat? One of the most interesting things about strength is when an athlete is balanced, his front squat and bench press 1 rep max will be very close together. The same is true for max reps, like this test. With the front squat test, I’m not only testing leg strength, but also strength balance between upper and lower body. I got 10 reps for both the bench and front squat. The hinge lift is a great test of overall, full body strength. I chose not to test a 1 rep max because of time constraints. I found 60 seconds to be about right for time. The 60/60 25m sprint for reps tests anaerobic endurance and the athlete’s ability to recover metabolically. I chose sprints as the “mode” to test anaerobic endurance and recovery over other means because I feel sprinting is a key fitness attribute for military athletes. Plus, no special equipment is needed for this test. This is one carryover from typical military fitness tests. Pulling power is another needed attribute for military athletes. We don’t do kipping pull ups in my gym or programming. I much prefer strict pull ups. This is a great, functional exercise for building and testing core strength. Doing the sandbag getup for reps over a relatively long interval, 10 minutes, also test the athlete’s work capacity. 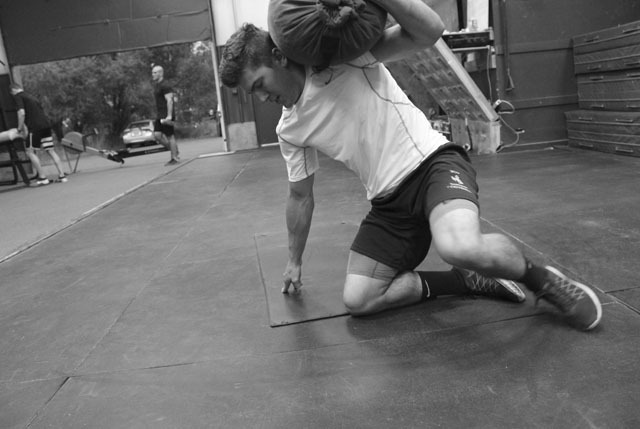 The sandbag getup is a full body exercise, which when done in high reps for time, will make you breath like a mother. This event pushes Operator Ugly into a stamina event. Running 3 miles within 30 minutes in a 25# weight vest or body armor is not difficult as a single event, but after a solid hour of intense work leading up to the run, finishing in 30 minutes is no joke. Work through the test briskly enough so you can complete it in 60 minutes. For the bench press, front squat, and dead lift, there is no set rest period between sets. Rather, perform the test with a partner, or pretend that you are. By the time each guy does the set, plus weight changes, you’ll be getting enough rest for these tests. Also, use the same barbell for each lift. The time it takes to unload the plates, re-set the racks for the front squat, and or, take off the barbell for the dead lift, etc, will give you the right amount of rest before starting the next exercise.